This is what I posted last Remembrance Day. I always cry when I picture my Grandpa as a teen spending his 17th birthday in a trench in France. I think of his romantic picture of war as a 16-year-old enlisting against his parents’ wishes and the juxtaposition of what greeted him in the mud in Belgium and France. We’ll always remember. For Remembrance Day, I think about the hundreds of thousands of Canadians over the years who interrupt their lives, and travel far from home, at great cost to themselves, to help strangers regain liberty. In particular I think about my grandfather, a teenager in 1917, who fought at Vimy Ridge. Two years ago, my mother and I made the pilgrimage to the Vimy Memorial and paid our respects. It cost over $2,000 to fly to Paris, take the train to Arras, and then a taxi to the memorial site, plus stay at hotels and eat. It was worth every penny to walk this hallowed ground. On April 9, 1917, Canadian soldiers stormed and bombarded this strategic escarpment that the Germans occupied and where 150,000 French and British troops had died while trying to take it back. Canada succeeded but lost 3,600 soldiers over four days of fighting and another 5,000 wounded. My grandfather’s role started in 1916, when he enlisted with the 43rd Battery, age 17. The Battery, formed by Major David McCrae, then Lieutenant-Colonel, father of Lt-Col Dr. John McCrae who wrote In Flanders Fields, shipped to England and then to the trenches in France where my grandpa spent his 18th birthday . My family knew our grandfather’s rank and where he fought during World War I but little else. Lieutenant Jim Mackenzie, served in the Canadian Field Artillery, and talked sparingly about the Great War until a second stroke loosened his tongue at the age of 82. It paralyzed his right side of his body, but that stroke couldn’t fell his ramrod posture or his dignity. My sister Liz remembers our stoic grandfather weeping when he recounted crawling out of a trench at Vimy to find out what happened to a messenger that he sent to the front an hour earlier. A few minutes after grandpa left, a bomb landed in that trench and killed every one of the men under his command. He had just been made their commander the day before. As my mother and I stood at the monument, designed by Canadian sculptor and architect Walter Seymour Allward, it was a peaceful, beautiful, yet sorrowful moment. The monument soars above the Douai plain and the view is stunning but the 11,285 names of Canadian soldiers carved into the monument, who fell in France in WWI and who have no known grave, resonate 93 years after the end of the war. Library and Archives Canada scanned the enlistment records for the over 600,000 men and women who enlisted in the Canadian Expeditionary Force (CEF) during the First World War (1914-1918) as soldiers, nurses and chaplains. The CEF database is an index to those service files. When I searched for my grandfather, the front and back of his enlistment sheet shows rich genealogical information such as his next of kin, names of his parents, the address he lived at when he signed up, his parents’ address, date of birth, occupation, his physical description, and results of his physical examination. 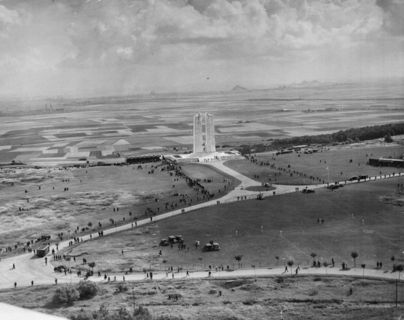 For information to get to the Canadian National Vimy Memorial, click here. See the Toronto Star’s excellent photo galleries for World War I and II. Thanks for sharing that, Peggy. So many of the war vets just wouldn’t talk about the experience. I think it’s still important to hear their stories. I wish I remembered more of my grandfather’s stories. I’m so glad I have siblings to share them.